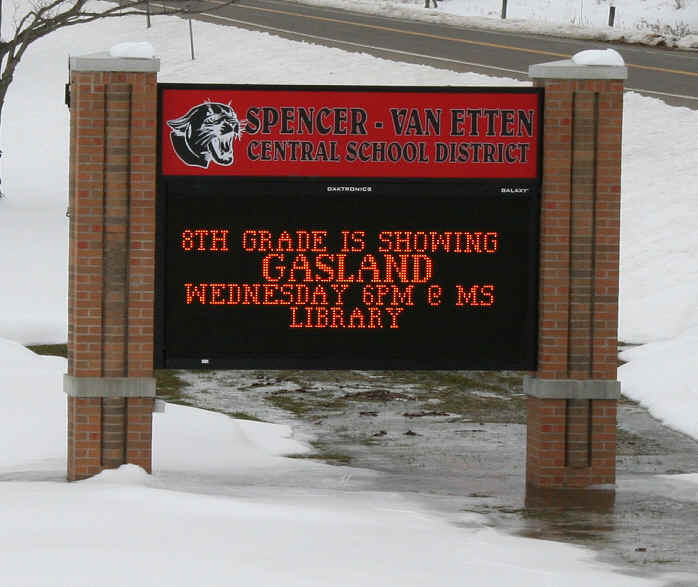 The anti- gas drilling propaganda movie "GASLAND" was shown to the school kids on March 9, 2011. This is an outrageous abuse of taxpayer money and shameless propagandizing to the students who cannot yet separate fact from fiction. The showing of the film also is a glaring demonstration of hypocrisy. Are the children told that their school is partly financed by royalties from gas drilling? The district receives royalties because district land is in a drilling unit! This is not the first time that the children have been duped by propaganda. The school also showed Al Gore's flick and a former superintendent even pulled voting age students out of their classes for a propaganda session in the auditorium on the day of a vote! No wonder that S-VE school district repeatedly on the worst school's list in NY State when education takes a back seat to indoctrination! Budget vote 2011. Read about the waste you are asked to vote for. Coaching salaries. Teachers unfamiliar with the sport have first dibs over experienced local coaches that would work for free.. Corrupt Teacher negotiations in the S-VE school district. Published July 22, 2010. 1) The voters were told that the tax increase would be 12% in an contingency budget. Is it legal for the Board to crank up the taxes to 29.9%? Due to mistakes, incompetence, waste and mismanagement they are pushing for a 18.1% tax increase. The state average is 7.5%. read the Star Gazette article by clicking here. Superintendent Bailey's latest spin in the Random Harvest about full value taxation. He equates land values in our district to land values in cities. Is there no limit to the distortions? Click here for facts. They claim that this year's big tax increase is a result of them not increasing taxes before. Click here to bunk that tall tale. Lies,Lies,Lies. Click here to read some of the tall stories the administration has told to manipulate your opinion. Superintendent C. Thomas Bailey says that senior citizens "Pay little or no school taxes". Really Mr. Bailey! Here a reprint of an article about my neighbor who lost her home. The article is a reprint from the 2001 May issue of "School Scandals". The article appeared two years ago, and neither of the board presidents mentioned in the article, have offered any help, or shown any remorse about their uncompassionate attitude toward the elderly who are unable to pay their school taxes. (new 9-30-03) Click here to read the article.